– Joint statement by Senate President Pro Tempore Joe Scarnati (R-Jefferson) and Senate Majority Leader Jake Corman (R-Centre) expressing outrage with the Jan. 22 State Supreme Court ruling calling PA Congressional District Maps unconstitutional. As part of continuing efforts to address Pennsylvania’s opioid crisis, the Senate approved legislation sponsored by Sen. Lisa Baker (R-Luzerne) that provides for the proper disposal of unused hospice drugs. Until recently, when a home hospice patient died, unused medications could be discarded by a hospice or homecare provider. A change to federal Drug Enforcement Agency rules now prohibits that practice. The result is home hospice providers cannot dispose of the drugs unless otherwise authorized by state law to dispose of the decedent’s personal property. This places an unnecessary burden on grieving families as they must find a legal way to dispose of those medications, which has resulted in the intentional or unintentional misuse or abuse of those drugs. Senate Bill 978, which gives hospice staff the authority to properly destroy unused drugs following a patient’s death, was unanimously approved by the Senate on Tuesday and now goes to the House of Representatives for consideration. The Senate unanimously approved legislation Tuesday to hold negligent property owners, not taxpayers, accountable for properties that are in the delinquent tax sale process. Senate Bill 851 amends the Real Estate Tax Sale Law to clarify ownership of these properties, many of which have code violations pending against them. The bill was sent to the House of Representatives for consideration. The Senate on Wednesday adopted a resolution calling for a study of a potential consolidation of PennDOT and the Pennsylvania Turnpike Commission operations. Senate Resolution 209, sponsored by Sen. John Rafferty (R-Montgomery), directs the Joint State Government Commission to study the challenges and opportunities of consolidating the interstate operations of PennDOT and the Turnpike Commission and to provide a final report with findings of fact, recommendations and any proposed legislative remedies. Also on Wednesday, the Senate adopted Senate Resolution 228, sponsored by Sen. John Eichelberger (R-Blair), legislation to establish a Task Force on Global Education. The task force will analyze global education in our K-12 schools, colleges and universities, and make recommendations to ensure Pennsylvania students graduate ready to compete in the global economy. Legislation sponsored by Sen. Elder Vogel (R-Beaver) to encourage the use of sustainable and environmentally safe slag material received final legislative approval Wednesday and was sent to the governor for enactment into law. Slag is generally used to remove waste in metal smelting, but can also serve other purposes, such as assisting in the temperature control of the smelting, and minimizing any re-oxidation during the production of solid metal. Two additional bills were sent to the governor this week. Senate Bill 542 permits pharmacists to dispense emergency prescription refills for uncontrolled substances for up to 30 days, with restrictions. House Bill 1608 renames a Huntingdon County bridge. Several GOP senators are taking aim at Pennsylvania’s excessive regulations to jump start the state’s economy. Sen. Scott Wagner (R-York), Sen. John DiSanto (R-Dauphin) and Sen. Michele Brooks (R-Mercer) announced Thursday they will introduce legislation to count, cap and cut the number of regulations in Pennsylvania. Senate Bill 373 allows patients to authorize payment of insurance benefits directly to dental service providers, a practice known as assignment-of-benefits. Senate Bill 817 extends a lease. Senate Bill 827 allows individuals to plan for the management and disposition of their digital assets by providing instructions in a will, trust, or power of attorney. Senate Bill 977 provides additional legislative oversight of the regulatory review process. House Bill 1448 charges the Department of Education with providing information on its website to compare institutions of higher education. The bill returns to the House for concurrence on Senate amendments. 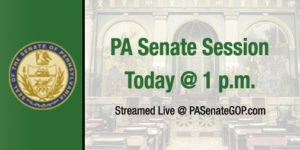 The Senate Appropriations Committee, chaired by Sen. Pat Browne (R-Lehigh), approved two bills on Jan. 22. Senate Bill 373 allows patients to authorize payment of insurance benefits directly to dental service providers. Senate Bill 851 clarifies ownership of properties that are in the delinquent tax sale process. The Senate Labor and Industry Committee, chaired by Sen. Kim Ward (R-Westmoreland) approved two bills on Tuesday. Senate Bill 963 addresses a recent Pennsylvania Supreme Court decision related to workers’ compensation. House Bill 1001 requires state licensure for home inspectors. Following the action of bills, the committee approved the nomination of Gerald Oleksiak to serve as the next Secretary of the Pennsylvania Department of Labor and Industry. The Senate Local Government Committee, chaired by Sen. Scott Wagner (R-York), approved several bills Tuesday. Senate Bill 950 authorizes county commissioners, by resolution, to implement a Voluntary Real Estate Sales Verification Form Pilot Program. House Bill 99 allows boroughs to issue contracts during an emergency without advertising, bidding or price quotations and requires council to disclose the reasons at its next public hearing. Also adds electricity to existing list of utility services for boroughs not subject to advertising, bidding or price quotations. House Bill 1034 provides additional procedures for the collection of monies by municipal authorities. The committee held a joint public hearing Monday with the House Local Government Committee on the state of municipal pensions in Pennsylvania, and legislation to address underfunded local pensions. The committees heard from representatives of PA municipalities, as well as police and firefighters who would be affected by changes in municipal pensions. The Senate Transportation Committee, chaired by Sen. John Rafferty (R-Montgomery), approved four bills on Wednesday. Senate Bill 880 allows 102-inch wide trailers on Pennsylvania highways. Senate Bill 1002 renames a bridge. Senate Bill 1015 adds “Special Emergency Response Team” to the definition of emergency service responders and emergency vehicles in state law. Senate Bill 1024 increases the distracted driving fine from $50 to $100 in an active work zone or on a highway safety corridor.